David Cameron meets Northern Irish political leaders in Stormont, becoming the second PM since devolution to address the House. 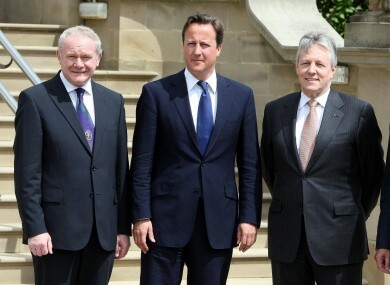 Prime minister David Cameron meets Martin McGuiness (left) and Peter Robinson (right) at Stormont this morning. BRITISH PRIME MINISTER David Cameron has made a historic address to the Northern Ireland Assembly in Stormont, in which he spoke of the “historic linkages and deep bonds” between Britain and Ireland. Speaking to a full house at Stormont – and becoming only the second Prime Minister to address the Assembly – Cameron said he was “passionate about this part of the United Kingdom, deeply mindful of its history, and deeply determined to work with you towards a better future”. The premier said what while he did not view Northern Ireland “through the prism of past and present security issues”, he had “a duty to give his honest view” on the future of the province. “Being an advocate of Northern Ireland, and wanting to see it progress, does not mean remaining silent on the problems that remain, and the responsibility of the members of this Assembly,” Cameron said. The prime minister also discussed the success of Queen Elizabeth’s recent visit to the Republic, where nobody had been left in doubt as to the “genuine warmth” of the welcome offered to the Queen, who herself had “joy in being there”. The murder of PSNI constable Ronan Kerr was also mentioned in Cameron’s speech, described as “a vile and cowardly act”. In a speech that largely skipped minute detail, Cameron did make reference to the continued duplication of some public services in the North given the split between Protestant and Catholic communities. The cost of duplicating such services was thought to be around £1.5bn (€1.69bn) a year, Cameron said. “Clearly more needs be done… but this is not just about the economic cost, it’s about the social cost too”. Cameron’s speech followed talks at Stormont Castle with the Northern Irish first minister Peter Robinson and the Deputy First Minister, Martin McGuinness. His visit to Belfast coincided with the holding of the by-election in the Westminster constituency of West Belfast, to fill the vacancy left by the resignation of Gerry Adams earlier this year. The first prime minister to address Stormont after devolution was Gordon Brown, who addressed the chamber in September 2008 shortly after he himself took office. Email “Cameron makes historic address to Stormont assembly”. Feedback on “Cameron makes historic address to Stormont assembly”.